Our strong education principles are what have helped us develop a method that is recognized and respected around the world. At Pingu’s English, we use proven play-based teaching techniques to help children stay engaged with the learning process. Our course is based on the Antarctic adventures of lovable little PinguTM. This provides a colorful and stimulating learning environment that’s fun to learn in. Pingu’s world will inspire your child’s imagination, and make sure the skills that they acquire are skills they have for life. We then use spiral learning and parental interaction to revisit and reinforce the knowledge that our children have acquired, giving them the skills and confidence they need to put what they’ve learned into action. We focus on teaching kids English in a way that enables them to develop as people, rather than just using a simple listen and repeat method. We combine listening, speaking, writing and reading skills to give children a comprehensive knowledge base. Not only do Pingu’s English students receive a valuable new life skill, they’re also introduced to full-time education in a balanced and welcoming way. We gently introduce children to the idea of learning within a classroom environment, helping to give them the patience and discipline they’ll need in full-time education. Our syllabus includes everything from written work, numeracy and IT to social engagement, craft skills, songs and games. This gives your child a rounded, positive first experience of education that will help them adapt to school in no time. Pingu’s English is truly a global enterprise. Since we were established in 2008, we’ve opened new learning centers in countries across Europe, Asia, Latin America and the Middle East. We know that each country has a different teaching method, and that every child learns in an individual way. That’s why our franchised education model is flexible enough to be applied to any country, culture or religious group. Our reach already includes centers in such different markets as Italy and Thailand, proving how universally adaptable our method can be. 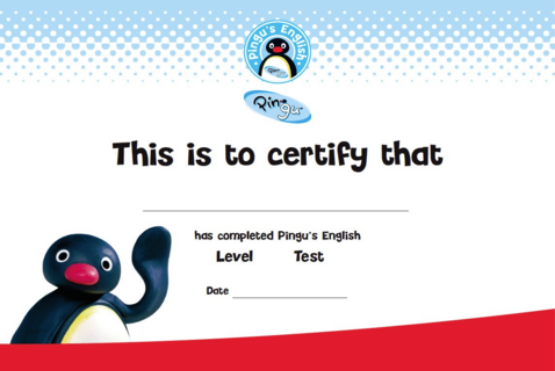 Find out how Pingu’s English can help your child learn a vital skill that will give them a head-start in life. To be confident in their English abilities. To help them adapt to an educational environment for the first time. The learning experience is interactive, colorful and fun similar to a Montessori model. To make sure they’re progressing and provide them with a Certificate of Achievement on completion of the course.